The South Zone were triumphant at the 2015 RYA 29th Eric Twiname Championships this weekend. They were crowned Eric Twiname Champions as well as winning the Eric Twiname Dinghy Trophy while the South West Zone won the Eric Twiname Windsurf Trophy. The South Zone picked up wins in all three of the dinghy classes and two of the windsurf classes in their charge to be crowned Champions. Winning both the Techno 6.8 and 7.8 the South West were a dominant force across all the windsurf classes. After a long postponement on day one, day two started on time and all classes completed a full schedule of racing. A moderate 15 knot breeze was recorded across the lake, perfect conditions for the 275 Zone and Home Country sailors. Charles Bacon (East) was the come-back kid of the day in the Optimist class. In yesterday’s only race Bacon scored a starting penalty but today, he notched up a 6-13-1 score line to finish in fifth overall: “It was pressurising towards the end of the last race because Sophie [Johnson] was catching up with me on the run. “I am really pleased, yesterday wasn’t a very good one but today was better,” concluded Bacon. Finishing second behind Bacon in the final race was Sophie Johnson (East) who put together a string of top ten results to finish on equal points with Oliver Sturley (South) and Jonathan Bailey (East). On count back Sturley topped the leader board as he had the most race wins and is the 2015 Optimist Eric Twiname Champion. RS Feva sailors Louis Wright and Jamie Allen (South) read the race course with ease today. Two wins and a sixth, which they now discard, leap-frogged them to the top of the results board in front of overnight leaders Jude and Eric Mcfarlane Bond (South West), to end the weekend triumphant as the 2015 RS Feva Eric Twiname Champions. Both the RS Feva and Optimist classes were won by the South Zone. Timothy Hartnell (South) had a similar day to yesterday, including another capsize when his mainsheet got stuck, however his double wins and two seventh place finishes was enough to put him at the top as 2015 Topper Eric Twiname Champion. With a building wind on the Topper course it suited Hartnell well: “I had a really good start in my last race and managed to win. I didn’t know I could win the event just maybe top three so I just tried really hard. For the third consecutive year the North Zone picked up the Team trophy in the Topper. Windsurfers Izzy Adcock (South) and Ethan Moody (South) picked up a clean sweep of wins in all four of their races today. Racing in the Techno 6.8 and 5.8m windsurf classes they both utilised their speed in the lighter conditions to claim the top honours. Toby Cave (East) sailing the Techno 7.8 almost had a clean sheet, three race wins and a second him at the top of the results board. Emily-Jane Eldred (South East) was involved in some really tight battles with Rafferty Reed (South) in the 4.5m, however Eldred just got the better of him and won all but one race this weekend to win the class. Overall the East won the 4.5m, the South 5.8m and the South West won the Techno 6.8 and 7.8 windsurf classes. 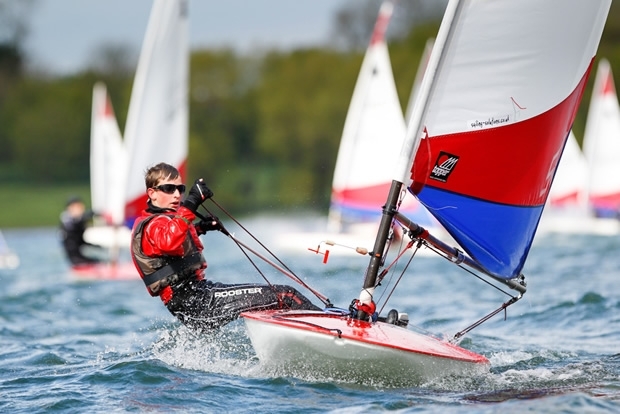 The second part of the selection process for the 2015 RYA Laser 4.7 UK Junior Squad is also took place alongside the Championships. Milo Gill-Taylor was almost faultless winning all but one of the races across the weekend. Arthur Brown was the only other sailor to pick up a win, and finished in second behind Gill-Taylor. Event Director and RYA High Performance Manager, Chris Atherton, was pleased with the event: “We have had a fantastic day of sailing for all today. After a shortage of racing yesterday it was great that we could complete the full day’s schedule. “The standard of all the fleets continues to improve year on year, and it is great to see new sailors coming through the Zone Pathway and competing at a national level for the first time.